Higher Natures True Food GTF Provides full organic Glucose Tolerance Factor Chromium. Bio transformed by a culture of Saccharomyces cerevisiae, the richest known food source of GTF. Chromium is a constituent ingredient of what is called the Glucose Tolerance Factor. It works closely with insulin to facilitate the uptake of glucose into cells. GTF and chromium may help support and maintain proper levels of sugar in the blood. Chromium supplements may also help maintain and support healthy weight management. Chromium may also help maintain and support healthy levels of cholesterol and triglycerides. Proprietary mixture: chromium chloride, zinc sulphate, niacinamide, pyridoxine HCI with enzyme digested Saccharomyces cerevisiae (with soya); bulking agent: microcrystalline cellulose; Jerusalem artichoke (inulin), anti-caking agent: magnesium stearate*; anti-caking agent: stearic acid*; coating: methylcellulose, glycerine, natural vanilla flavour (agave syrup, flavour: vanilla extract; colour: caramel). Adults: Take 1 tablet a day, with or between meals, or as your health professional advises. Children over 8 years: Take 1 tablet on alternate days, with or between meals, or as your health professional advises. Below are reviews of True Food GTF Chromium - 90 Tablets by bodykind customers. If you have tried this product we'd love to hear what you think so please leave a review. 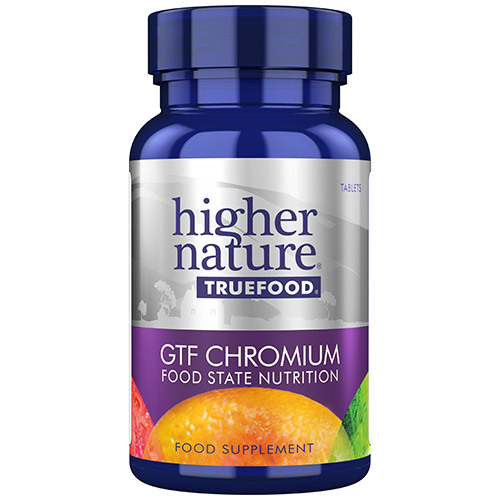 Question about True Food GTF Chromium - 90 Tablets Are the True Food supplements suitable for those with an intolerance to yeast? 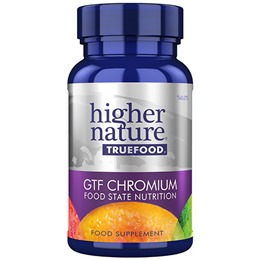 Question about True Food GTF Chromium - 90 Tablets Are the nutrients in the True Food range synthetic?